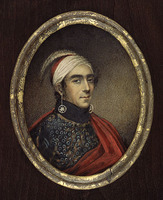 KENWENDESHON (Henry Aaron Hill), Mohawk, Church of England catechist, and translator; eldest son of Karonghyonte (David Hill); m. Christiana Brant, second child of Thayendanegea* (Joseph Brant), and they had at least three children; d. 1834 of cholera at the Grand River, Upper Canada. The name Kenwendeshon, borne in the early 19th century by the subject of this biography, apparently belonged to the wolf clan of the Mohawks and meant “longer days.” By that period Mohawks were well acquainted with white customs and some had begun to use family names in the manner of their neighbours. The Hills were among them; indeed, Henry Aaron Hill seems to have preferred his European name. 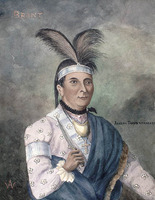 When chief David Hill died about 1790, Joseph Brant attempted to have Henry Aaron succeed him, but Iroquois custom prevailed and the title passed in the female line instead. Nevertheless, Henry Aaron Hill was later regarded by some observers as a chief. On visiting the Grand River in 1792, Patrick Campbell described Hill as a young man “of very agreeable looks and mild manners,” who had been “the best scholar” at Harvard. That university, however, has no record of his presence. Nevertheless, Hill was sometimes spoken of as doctor. During the War of 1812 he took part in the ambush of American forces on 24 June 1813 at Beaver Dams (Thorold) [see William Johnson Kerr*]. In November 1814 he was one of a small party which prevented a large American force from crossing the Grand River to attack Burlington Heights (Hamilton) from the rear. Called “a faithful Warrior on all occasions,” Hill was wounded in the thigh and hand in this action. 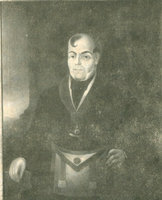 By 1816 Hill was acting as interpreter at councils of the Six Nations and conducting services at the Mohawk chapel (which still stands in Brantford). He “touched his cheeks and forehead with a few spots of vermilion, in honour of Sunday; he wore a surplice, and preached at considerable length; but his delivery was unimpassioned, and monotonous in the extreme,” according to traveller Francis Hall. St Paul’s Church, as the chapel was named, was occasionally visited by the Church of England clergyman from Niagara (Niagara-on-the-Lake), and later from Ancaster. More usually an Indian catechist would read the prayers. Hill acted as reader and interpreter to Ralph Leeming* in 1821 and was described by Robert Addison the following year as catechist for the Society for the Propagation of the Gospel. The first resident Anglican clergyman at the Grand River, William Hough, was appointed in 1826. But the use of catechists continued, and in fact it was only in 1827 that Hill was officially designated a catechist for the SPG, at an annual salary of £20. He continued in the post when the interdenominational New England Company took over the mission in 1827. 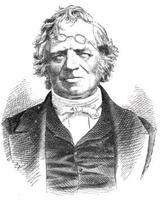 Hough’s appointment had been made partly in response to the establishment of a Methodist mission on the Grand in 1822. Indeed, it turned out to be the Methodists who encouraged Hill’s program of translation. Joseph Brant’s Gospel of St Mark had been appended to an SPG Mohawk prayer-book printed in 1787, and John Norton’s Gospel of St John had been published by the British and Foreign Bible Society in 1804. Despite adverse comments on the quality of the translation, Norton, encouraged by the SPG, resumed the work of completing the gospels, and he enlisted Hill’s aid. But Norton was tiring of the task and thought that the Mohawks themselves would prefer English bibles. The American Bible Society discovered in 1823 that Hill, with the support of John Brant [Tekarihogen], was already working on Luke, and proposed that he complete the four gospels. Missionary William Case* passed along reports that Hill was at times subject to intoxication, though some said he was reforming. Despite Case’s qualms, Hill proved to be a diligent worker. His Luke appeared in 1828 (the title page says 1827, but the printer in New York, Azor Hoyt, had much trouble in setting the work). Three hundred and fifty copies were sent to the Methodist mission on the Grand and fifty to Lower Canada. The Church of England, holding aloof from association with dissenters in bible societies, made little use of the translations done by its catechist. In turn, the American Bible Society’s interest waned. The York Auxiliary Bible Society, formed in 1828, saw that some Mohawk scriptures were already available and began work on Ojibwa translations instead. The continued publication of Mohawk scriptures was therefore undertaken by the Young Men’s Bible Society of New York, an auxiliary to the Methodist Episcopal Church in the United States. Between 1831 and 1836 it sponsored translation of the rest of the New Testament, with the exception of 2 Corinthians. The bulk of the work was done by Hill, with corrections and completions (Hill died in 1834) by Brantford merchant John Aston Wilkes, Mohawk schoolmaster William Hess, and Elizabeth Kerr, née Brant. Hill’s Isaiah, finished by Hess, was published by the American Bible Society in 1839, but that organization resisted pressure to proceed with the rest of the Old Testament. Hill was also the chief translator of a collection of psalms and hymns, which went through separate printings for its Methodist and Anglican users. To some people, Henry Aaron Hill appeared to be more than he was: doctor, clergyman, chief. But on the title pages of his translations, his name was often missing. Although his work as a translator was little recognized in his own time or later, it was to him that the Mohawks owed the bulk of the scriptures and hymns in their own language. For further publication details about the translations with which Henry Aaron Hill was involved, the reader is referred to J. C. Pilling, “Bibliography of the Iroquoian languages,” Smithsonian Institution, Bureau of American Ethnology, Bull. (Washington), 6 (1888): 82–86. AO, ms 500, H. A. Hill, deposition, 28 June 1830. P. Campbell, Travels in North America (Langton and Ganong). Doc. hist. of campaign upon Niagara frontier (Cruikshank), 2: 308–10. Francis Hall, Travels in Canada, and the United States, in 1816 and 1817 (London, 1818). Norton, Journal (Klinck and Talman). “The Rev. Robert Addison: extracts from the reports and (manuscript) journals of the Society for the Propagation of the Gospel in Foreign Parts,” ed. A. H. Young, OH, 19 (1922): 186–90. SPG, [Annual report] (London), 1827: 165–66; 1828: 189. Valley of Six Nations (Johnston). John West, A journal of a mission to the Indians of the British provinces, of New Brunswick, and Nova Scotia, and the Mohawks, on the Ouse, or Grand River, Upper Canada (London, 1827), 278. Biblio. of Canadiana: first supp. (Boyle and Colbeck). Officers of British forces in Canada (Irving), 220–21. R. E. Ruggle, “A house divided against itself: the denominational antagonisms of the Grand River missions” (papers presented at the meeting of the Canadian Soc. of Church Hist., London, Ont., 1978), 1–10. Richard E. Ruggle, “KENWENDESHON,” in Dictionary of Canadian Biography, vol. 6, University of Toronto/Université Laval, 2003–, accessed April 22, 2019, http://www.biographi.ca/en/bio/kenwendeshon_6E.html.